Linda winching, supervised by Blue Watch Leader - Anne. Today is my third day ever on a boat, and first time putting to sea. Along with several of the other novices there is a great deal of excitement, anticipation, and eagerness to get under way. My previous experience of sailing consists of watching dodgy 80s soap Howard’s Way, but so far no evidence of any beautiful people, big hair or shoulder pads. After setting off from our mooring at Gosport we headed out into the <?xml:namespace prefix = st1 ns = "urn:schemas-microsoft-com:office:smarttags" />Solent to learn various drills. First of all we tried tacking, then gybing, both of which involved a great deal of letting out and pulling in of sheets (only one of the terms used for what I would usually call a rope), and a lot of winching. Needless to say a lot of sweating and puffing and panting accompanied the unaccustomed exertions, but a lot of the sailing jargon and terminology started to fall into place. In between the serious work, we were treated to yet more tales of vomiting and how to avoid it by Windy and Daz. One particular story came true shortly afterwards, and describes how to maintain the illusion of normality when you are below decks, in spite of the fact that you and everything around you is being swilled around like the contents of a washing machine. Top tip is not to hang anything up which will give away the fact that you are not, in fact on terra firma, e.g tea towels in the galley. The next and very important and serious task was Man Overboard drills. During this exercise the fore and stay sails had to come down to at allow the boat the manoeuvre more easily to retrieve the casualty. The bright orange clad dummy was duly tossed over the side and at the second attempt was duly retrieved. Having been deemed to have survived the ordeal he duly went in again, and this time we got him first time. Needless to say what had come down had to go back up – ie the fore and and stay sails – cue more puffing and sweating. Meantime, red watch who were the off shift at this time started to experience sweating for a different reason, being one of the typical early signs that all is not well in the digestive department. Mike was first to succumb, and spectacularly so, followed closely by Dave, Khush, Kheira and Ram. Those of us who were up top were just thankful that we were being kept busy – thinking of something else being a good way to keep thoughts of your churning stomach at bay. Various other skills needed to be learned and we discussed the various other vessels which could be seen in the distance, how to assess which posed the most threat in terms of potential collision courses, and how to identify where they were headed, how fast and how the picture would change once it got dark. Finally it was time for dinner, which Kheira and Khush had somehow managed to help prepare in spite of feeling very much the worse for wear. Spag Bol was served up by Windy who had by now assumed Mother duties, and while most of red watch had decided to pass, the rest of us tucked in enthusiastically, keen to stock up on calories after a hard days work – with lots more yet to come. All in all a great first day, with lots to learn. After all this talk of vomiting I think I might have to go for some fresh air! Miles to do are becoming few! We can almost smell Blighty!! Crew Profiles - second edition! Another note from the other mate! Ocean 3 - Hot off the press! A message from the mate! Another day out of the office! Happiness is a warm bucket of water! DAY 2 - WE ARE OFF! Preparation Day - Work Experience! Bakewell Tarts - the Skipper's Favourites! Men can do 3 things at once ... !!! 3/4 of us ... ! The trip around the Island. 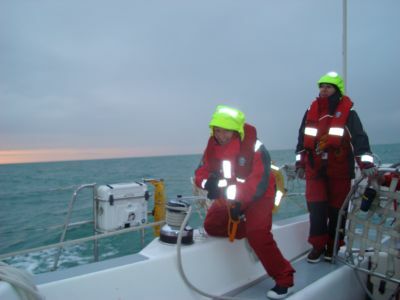 Memories of Sail Training Week 2 - Final Blog! End of the Vomit Comet. Blue Watch reach from Weymouth to Portsmouth in up to 49 knots of breeze! UP THE 82 FOOT MAST TODAY!